The MACD BB Lines indicator is built from a standard MACD indicator with Bollinger Bands added to the signal line. The MACD values are shown as dots. The indicator is typically used to generate with-trend entries on a breakthrough of the upper / lower Bollinger Bands. The MACD BB Lines is typically used to generate with-trend entries on a breakthrough of the upper / lower Bollinger Bands. Minor trend: The minor lower timeframe trend is up when the MACD is rising. It is down when the MACD is falling. Major trend: The higher timeframe trend may be taken from the MACD itself. An major uptrend is signaled when MACD > 0, while MACD < 0 stands for a major downtrend. Public Properties: The indicator comes with a few public Series<double> that can be accessed via other indicators or automated strategies. These will also shown in the strategy builder. The series “Trend” may be used to detect the minor trend. “Trend” will show the value +2 when the MACD is rising and above the upper Bollinger Band, +1 when it is rising and below the upper Bollinger Band, -1 when it is falling and above the lower Bollinger Band, -2 when it is falling and below the lower Bollinger Band. You will further find two Series<double> “LongSignal” and “ShortSignal”. “LongSignal” will return +2 for an upper band breakthrough in a major uptrend (strong signal), +1 for an upper band breakthrough in a major downtrend (weak signal) and 0 for no signal. Converesely, “ShortSignal” will return +2 for a lower band breakthrough in a major downtrend (strong signal), +1 for an lower band breakthrough in a major uptrend (weak signal) and 0 for no signal. Market Analyzer Column: The indicator also comes with two separate market analyzer columns. The first column will simply indicate the trend and return values based on rising and falling MACD above or below the Bollinger Bands as described above. The second column will return entry signals, where +2 stand for a strong long signal, + 1 for a weak long signal, 0, for no signal, -1 for a weak short signal and – 2 for a strong short signal. Long and short signals are called using a single column, due to the limited space available in the market analyzer itself. For the Series<double> objects, LongSignal and ShortSignal series have been separated, as they are designed to return positive values or 0 for no signal only. Please be mindful of this distinction. Paint Bars: The indicator comes with paint bars that reflect the minor trend. The colors are similar to the colors for the MACDBB dots, but you may differentiate between upcloses and downcloses. 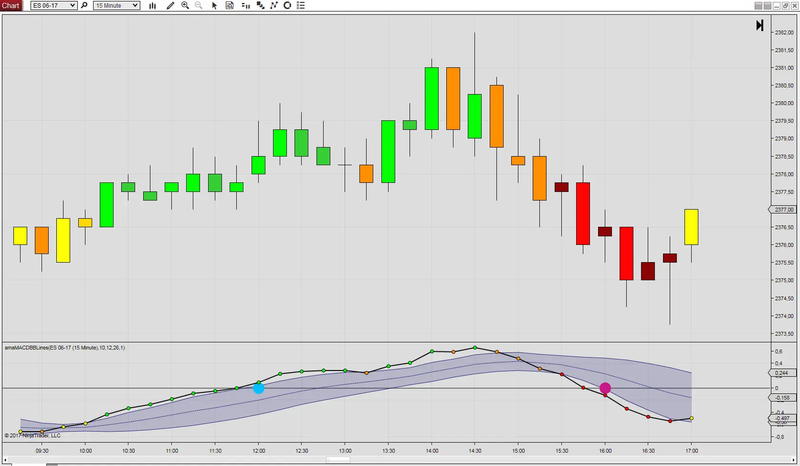 Sound Alerts: The indicator comes with sound alerts that will be triggered on a breakthrough of the upper / lower bands, or when the major trend changes occur.